"That's a tough team to beat on their home floor," said MSU head coach Greg Todd. "They weren't going to let us just run away with it and they battled back a few times but our girls did a good job of rallying each time they made a run." Eastern Illinois, which was 8-2 at home entering the game, trailed by 12 at halftime and then by as many as 18 in the third quarter before making a run to cut the Eagles lead to five at the end of the third. Morehead State responded with a 7-0 run to open the forth to pull away 57-45 with 6:52 remaining in the game. A triple by junior guard Aliyah Jeune with 2:16 remaining put the game on ice as the Eagles mounted a 14-point advantage. Graduate forward McKenzie Calvert caused havoc for the Panthers with her defense in game as she collected a career-best six steals. Calvert also added 12 points, six rebounds, three assists, and one block to her final stat line. Senior Miranda Crockett paced the Eagles' in scoring with 15 points while also pulling home six boards. Crockett has now scored in double figures in 27-straight games. Senior guard Crystal Simmons-Cozar knocked down two of MSU's three triples and finished with 12 points while also grabbing five rebounds and dishing five dimes. Senior forward Tierra McGowan rounded out the team's double-digit scorers with 10 points. Jeune scored nine points in the game which was the lowest output for the five-time OVC Newcomer of the Week since scoring just eight points against num. 1 Baylor on December 12. 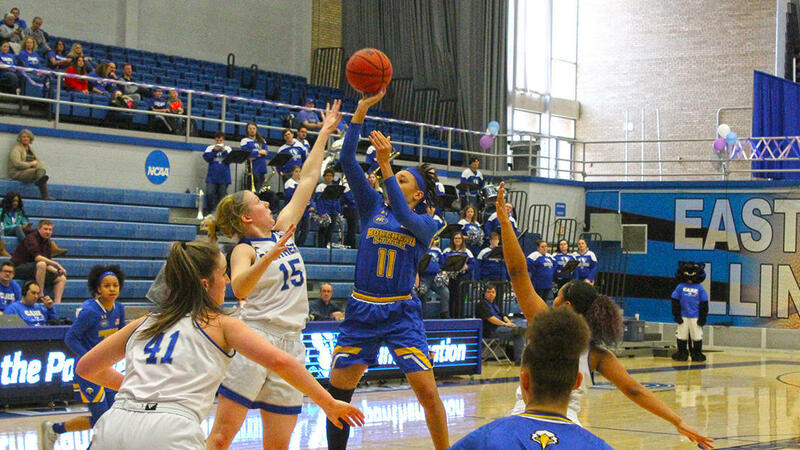 McGowan hauled in a game-best eight rebounds as the Eagles outrebounded Eastern Illinois 39-32. Morehead State returned home next Thursday to face off with Tennessee State. The Eagles defeated the Lady Tigers on 85-62 on January 12 in Nashville. The game will tipoff at 5:05 p.m. ET.